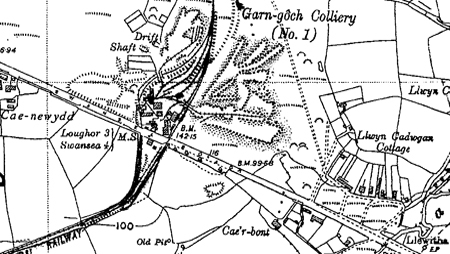 Garngoch No.1 Colliery Area reproduced from (1936 -1947) Ordnance Survey map. The Garngoch No. 1 Pit, 1.5 miles north-east of Gowerton railway station. It struck the Swansea Five-Feet seam at a depth of 205 yards. Colliery Explosion: At the time, the mine was being worked with naked lights. Collier victims: John Lewis, 30 years, Daniel Rees, 29 years, Thomas Hugh 29 years, William Morgan 33 years, David Rosser, 21 years, Daniel Watkins aged 14 years collier's boy. The mine was inspected before and after the explosion and no gas was found. The jury brought a verdict of 'Accidental Death'. Safety lamps were recommended and the owner was reported to have acted on this recommendation. Swansea Sanitary Authority: Mr Glasbrook & Garngoch Colliery water. Carngoch (Garngoch) & Gorseinon Colllieries dispute: Results of talks put to workers. Sliding scale committee of coal owners. The manager of No. 1 Colliery was Charles Richard (1846-1928) retired, colliery workmen made him a presentation of a gold watch as a mark of admiration as a mine manager. Managed by J.W. Evans. Employed 212 / 76 men. Closed in that year. No.l Pit was reopened. Employed 520 men. Manager J.W. Evans. The pit was originally rectangular in shape. When they hit the Six-Feet seam in March at a depth of 259 yards it was altered to a 14 feet diameter. No.l Pit employed 160 men. A drift was used to bring the coal 150 yards from No.1 Pit to the east. A slant was used for trams to brought to the service and the pit utalised for ventalation purposes. 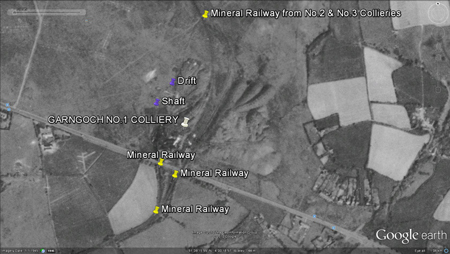 A drift can be seen on 1945 & 2009 Google Earth images, also known as Garngoch No.4.This closed in 1919. The No.l employed 135 men and was managed by W. Morgan. Mr W. Davies was the manager and employed 295/103. The No.l employed 346 men and was managed by W. Davies. surveyor Mr T. Bryn Richard. Employed 430/ 85 men, with the manager being W. Davies. No.l Employed 435 men under J. Tanner. Mr. Tanner employed 355 /61 men in the No.l Pit. The No.l Pit employed 289/50, the manager being T. Roberts. Western Division's, No.l (Swansea) Area, No.l Pit employed 166/67 working the Six-Feet seam. Manager E. Rolfe. Garngoch No.1 Pit was closed by the National Coal Board. The No.l Pit worked - Swansea three, four, five and six foot seams. "The railway line from Gowerton Station (G.W.R) to Garngoch Collieries built by John Glasbrock in the early 1870's, afterwards managed by his sons Messrs. Glasbrock Brothers, runs close up to the south side of the old canal for a distance of approximately 650 yards. 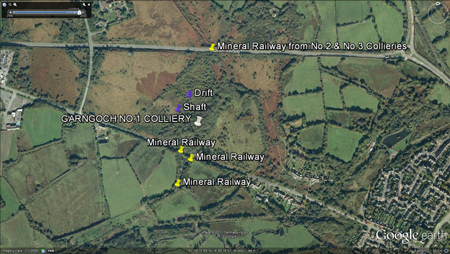 This railway line, as far as Garngoch No.1 Colliery, was doubtlessly surveyed and constructed under the supervision of Thomas Richard, Sen., and extended across Garngoch Common during 1855-86 by his son when the No.2 Pits were being sunk alongside the road from Penllergaer to Gorseinon." Gower - Vol. 21. 1970 The beginning of the Coal Industry in Loughor. * date source: Glanmor Williams (edited), Swansea an Illustrated History, 1990, p51. (C) Cambrian [web filtered] | Available from the Swansea County Hall.